Looks weird, right? 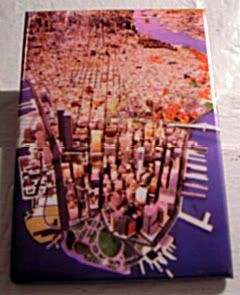 It's the borough of Manhattan, as seen in the NYC Panorama over at the Queens Museum of Art. I freakin' love this place. I've mentioned it before, but Robert Moses had it created for the 1964 World's Fair. It amazed people back then, and it's doing the same thing now. I love looking at maps - so when I see this thing, I just kinda want to sit for hours, trying to look at different neighborhoods, figuring out where my buildings are, watching the plane fly in and out of La Guardia. Endless entertainment. I've done one guided tour walking around the little skyway veranda thing, but Jeremiah's Vanishing New York got to go behind the scenes and actually walk in it. Panorama Part 1: New York Paleotectonic, in which we learn where all vanished buildings go to die, and also how to adopt a NY building. $10k is a bit steep for me, but I'd love to buy the Sony Tower. Or the Fred F. French building. Or 30 Rock. Or the Ford Foundation building. Or...yeah, it'd be hard to decide. Panorama Part 2: Brooklyn in a Book, in which we learn a bit about Brooklyn. Panorama Part 3: A Walk Up the East River, in which we step. Into. The. Map. Yep, Joey Tribbiani would have been proud.